This Government is fast becoming the most authoritarian threat to our liberties of the modern era. 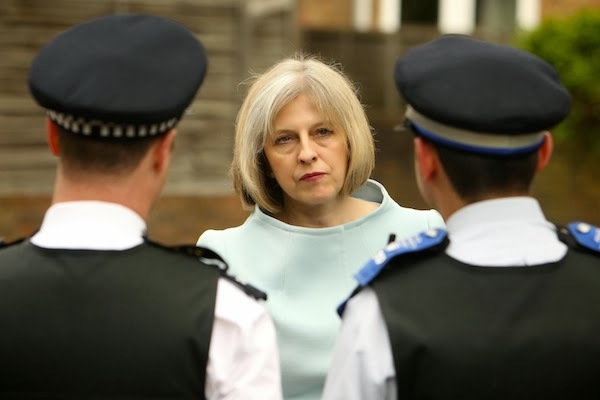 Not content with reintroducing state regulation of the press, the Home Secretary Theresa May is intent on outlawing anything that people may find 'annoying'. The judicious John Bingham writes in the Telegraph: Christian preachers, buskers and peaceful protesters could effectively be driven off the streets under draconian new powers designed to clamp on anyone deemed "annoying", according to a former Director of Public Prosecutions. Lord Macdonald QC said Theresa May, the Home Secretary's plans for a new civil injunctions to replace Anti-Social Behaviour Orders (Asbos) amount to "gross state interference" with people's private lives and basic freedoms. In a formal legal opinion being circulated to peers, he savages the proposals as opening the way for the outright "suppression" of anything deemed "potentially annoying" with only "vague" justification. The proposed safeguards to prevent abuse of the new system are "shockingly" weak, he writes. Under proposals currently before Parliament, Asbos are to be scrapped and replaced with wide-ranging new orders known as Ipnas (Injunctions to Prevent Nuisance and Annoyance). How is this statutory proposal to be balanced with the freedom of speech and the freedom of expression? What of the freedom to preach the Gospel? Christians are called to proclaim the Good News. Whether it be from a pulpit, on television or walking up and down Oxford Street with a sandwich board, such proclamation ought to be tolerated in the public sphere in a free society. While some might preach the wonders of heaven, the Way of Salvation and the boundless love of Jesus, others choose to focus on sin and damnation. The two are not necessarily mutually exclusive, but those who focus on the latter are certainly annoying. In 1999 Lord Justice Sedley championed the rights of people to express such views, and quoted Socrates and two famous Quakers in doing so. There is no breach of the peace if what is uttered is merely offensive. He said: "Free speech includes not only the offensive, but the irritating, the contentious, the eccentric, the heretical, the unwelcome and the provocative, providing it does not tend to provoke violence." Theresa May is trying to outlaw His Grace. The world has seen too many examples of state control and censorship of unofficial utterances. Some may well find this blog offensive, irritating, contentious, eccentric, heretical, unwelcome and provocative, but it is His Grace's judgment that society is all the better for such expressions being permitted: freedom reigns while people are at liberty to spout their views. His Grace draws the line at prejudice, irrational discrimination or incitement to violence. Or he used to, before Labour introduced the concept of 'hate speech'. But now, it seems, any utterance which a minority group might find offensive is to be outlawed by the spawn of ASBO. The contentious, eccentric, heretical, unwelcome and provocative must give way to a state-enforced normative orthodoxy of denatured social harmony. Think again, before you irritate His Grace overmuch and things get messy.